A paper published today in Biogeosciences unexpectedly finds farmed grasslands are a net annual source of CO2 to the atmosphere, and also a weak methane sink to the atmosphere. The authors studied 3 Swiss grasslands managed at different levels of intensity, one without fertilizer applied, one with moderate use, and one extensively managed with heavy use of fertilizer, but finds all three acted as net sources of CO2 to the atmosphere, finding "Mean annual soil and plant respiration losses of CO2, measured with opaque chambers, ranged from 5.2 to 6.5 μmol m−2 s−1." 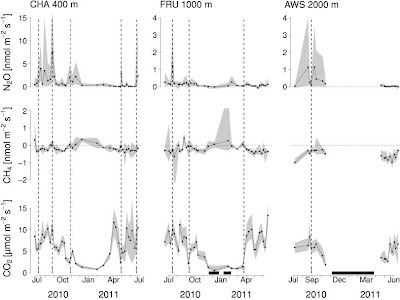 CO2 fluxes at 3 differently managed grasslands shown in bottom row of graphs. Positive values indicate a net source of CO2 to the atmosphere. Top graphs show grasslands are also a net source of the "greenhouse" gas N20, and middle graphs show grasslands are a weak sink for methane [CH4]. Abstract. A profound understanding of temporal and spatial variabilities of soil carbon dioxide (CO2), methane (CH4) and nitrous oxide (N2O) fluxes between terrestrial ecosystems and the atmosphere is needed to reliably quantify these fluxes and to develop future mitigation strategies. For managed grassland ecosystems, temporal and spatial variabilities of these three soil greenhouse gas (GHG) fluxes occur due to changes in environmental drivers as well as fertilizer applications, harvests and grazing. To assess how such changes affect soil GHG fluxes at Swiss grassland sites, we studied three sites along an altitudinal gradient that corresponds to a management gradient: from 400 m a.s.l. (intensively managed) to 1000 m a.s.l. (moderately intensive managed) to 2000 m a.s.l. (extensively managed). 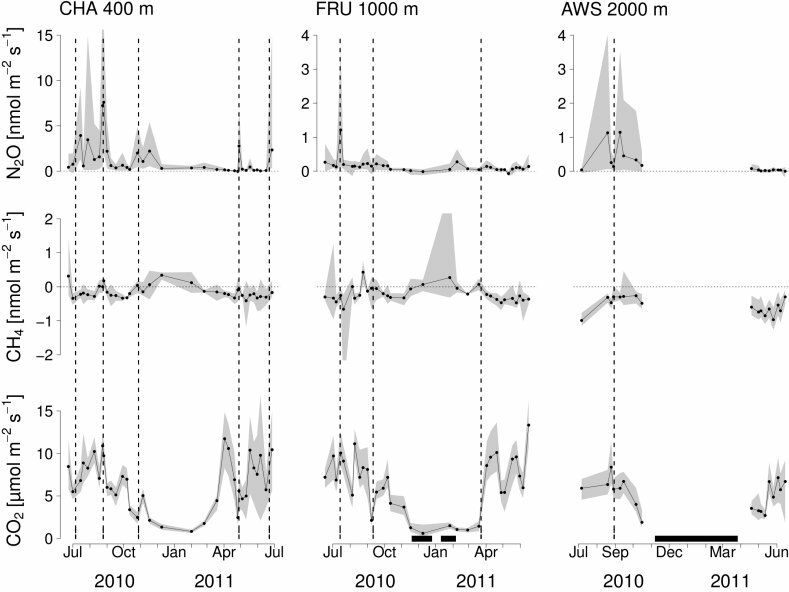 The alpine grassland was included to study both effects of extensive management on CH4 and N2O fluxes and the different climate regime occurring at this altitude. Temporal and spatial variabilities of soil GHG fluxes and environmental drivers on various timescales were determined along transects of 16 static soil chambers at each site. All three grasslands were N2O sources, with mean annual soil fluxes ranging from 0.15 to 1.28 nmol m−2 s−1. Contrastingly, all sites were weak CH4 sinks, with soil uptake rates ranging from −0.56 to −0.15 nmol m−2 s−1. Mean annual soil and plant respiration losses of CO2, measured with opaque chambers, ranged from 5.2 to 6.5 μmol m−2 s−1. [positive numbers indicate a net source] While the environmental drivers and their respective explanatory power for soil N2O emissions differed considerably among the three grasslands (adjusted r2 ranging from 0.19 to 0.42), CH4 and CO2 soil fluxes were much better constrained (adjusted r2 ranging from 0.46 to 0.80) by soil water content and air temperature, respectively. Throughout the year, spatial heterogeneity was particularly high for soil N2O and CH4 fluxes. We found permanent hot spots for soil N2O emissions as well as locations of permanently lower soil CH4 uptake rates at the extensively managed alpine site. Including hot spots was essential to obtain a representative mean soil flux for the respective ecosystem. At the intensively managed grassland, management effects clearly dominated over effects of environmental drivers on soil N2O fluxes. For CO2 and CH4, the importance of management effects did depend on the status of the vegetation (LAI). There is only about 1,000 other studies that completely contradict this finding. Grassland is a huge sink probably responsible for a net sink of about 2 billion tons Carbon per year. According to the paper, 2 prior papers said net CO2 flux of European grasslands was uncertain, and 2 prior papers said European grasslands were a net CO2 sink. Your statement "There is [sic] only about 1,000 other studies that completely contradict this finding" is demonstrably false. According to the paper, "While Vleeshouwers and Verhagen (2002)and Janssens et al. (2003) reported that the GWP of European grasslands is still highly uncertain, Soussana et al. (2007) and Schulze et al. (2009) estimated that European grasslands had negative GWPs (including vertical and lateral ﬂuxes of the three GHGs: e.g., fertilizer input, harvested biomass, animal emissions. In particular, all these investigated European grasslands were net sinks for CO2 on an annual timescale. et al., 2007; Schulze et al., 2009). These two studies, however, did not consider grasslands at higher elevations, with cooler and wetter climatic conditions that may subsequently lead to higher soil CH4 and N2O emissions. Mountain regions are characterized by more orographic precipitation under episodic inﬂuences of maritime air masses, with lower evapotranspiration rates due to lower temperatures, both contributing to wetter soils (Beniston, 2005) and potentially higher soil emissions of CH4 and N2O."